Wild horse Cobra has been voted the US Equestrian 2018 National Horse of the Year, and dressage star Verdades has taken out the International Horse of the Year award. Both winners were determined based on the results of online voting, and the awards were presented at the US Equestrian Annual Meeting in West Palm Beach, Florida, at the weekend. Since being rounded up in the mountains of Nevada at the age of six, Cobra’s trainer and owner Marsha Hartford-Sapp has been devoted to the 14-year-old mustang gelding and trained him with caution and respect for his instincts, creating a deep bond. Their mutual trust has seen them through competitions in both classical and Western dressage, where Cobra’s versatility and talent for each has been apparent. As one of the founding horses of USEF Western dressage competition, Cobra was one of the first recipients of the 2015 Horse of the Year awards in that discipline and has continued to collect numerous accolades ever since. Verdades, affectionately known as Diddy, and owned by Laura Graves and Curt Maes, began his journey to international success in 2014 after garnering attention from his reserve-champion finish at the US Dressage Festival of Champions. Since his launch into the spotlight with his life-long rider and trainer Graves, the 16-year-old Dutch Warmblood gelding’s achievements and continued success are profound. In 2018, Verdades (Florett AS x Liwilarda/Goya) won the Grand Prix at the FEI World Cup Dressage Finals in Paris and helped the U. team earn a silver medal in the FEI Dressage Nations Cup Germany. He and Graves then rode for silver medal-winning team at the FEI World Equestrian Games at Tryon in 2018. Hunter Harrison with McLain Ward. The late Hunter Harrison, owner of Double H Farm, was awarded the Richard E. McDevitt Award of Merit at the Pegasus Awards Dinner during the US Equestrian Annual Meeting. Harrison, whose involvement in the horse world began when his daughter, Cayce, began riding as a child, became an enthusiastic and generous supporter of the sport. Horses with the HH prefix have won grand prix events all over the world. Harrison also spearheaded the extensive corporate sponsorship of show jumping by the rail companies Canadian National Railway and Canadian Pacific Railway. He died on December 16, 2017. “E. Hunter Harrison made a lasting impression on the sport of jumping in the horses he bred, the athletes he supported, and the ways that he helped them to grow,” said Elisabeth Goth, Vice-President of the Board of Directors of US Equestrian. “Double H Farm was established in 2002 and quickly developed from a hobby into a well-respected equestrian business. “The HH horses have made their mark on the top levels of jumping throughout the last 15 years. Harrison owned many elite jumping horses like HH Azur, Sapphire, HH Carlos Z, HH Rebozo, HH Rufus, Night Train, and more. 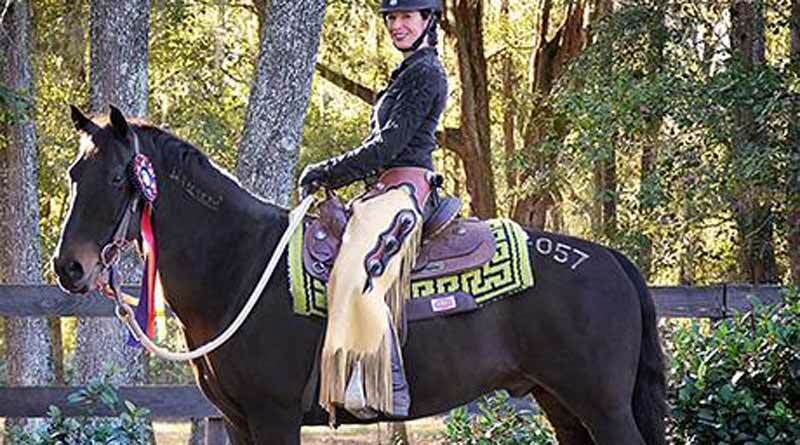 Hunter was passionate about bringing great horses and athletes together. People will never forget the partnership of McLain Ward and Hunter’s two-time Olympic team gold medal-winning mare Sapphire, or Ward’s home-turf win with HH Azur at the 2017 FEI Jumping World Cup Final,” Goth continued. Harrison’s wife Jeannie, daughter Cayce Harrison Judge, and son-in-law, Quentin Judge, accepted the award on his behalf. How Harrison achieved such remarkable success both professionally and in the horse world is detailed in the biography “Railroader: The Unfiltered Genius and Controversy of Four-Time CEO Hunter Harrison.” The book describes Harrison’s rise from his early days working in a rail yard through his strikingly successful rise to serving as Chief Executive Officer of four publicly traded companies. Retired Racehorse Project (RRP) founder Steuart Pittman received the EQUUS Foundation Humanitarian Award at the Pegasus Awards Dinner. The award honors a member of the equestrian world who has devoted considerable personal time to making the quality of life of our equine partners paramount. Pittman has spent most of his career in the horse business and much of that with Thoroughbreds who had started their careers on the racetrack. As the eighth generation of his family to own and operate the 550-acre Dodon Farm in Davidsonville, Maryland, he made his living there as a breeder, trainer, and competitor in three-day eventing. He said his aim with the Retired Racehorse Project was two-fold: first, to create a horse industry-based initiative to market the sporting and commercial value of ex-racehorses and, second, to provide educational resources for owners and trainers that would help those horses transition successfully into new careers. Pittman was recently elected County Executive for Anne Arundel County in Maryland.